Like the bosses they are, the ladies behind Speed Rack are hosting their national finals on Thursday, May 16 in the East Village. 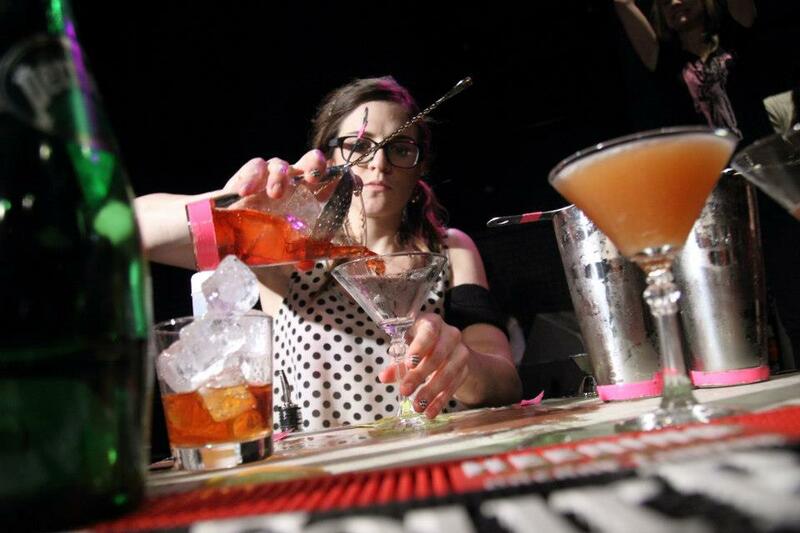 The fastest, most talented female bartenders in the top 10 cocktail cities (as well as six “wildcard” contestants who won online votes) will go shaker-to-shaker for an esteemed judging panel and live audience to crown Miss Speed Rack USA 2013. Guests who attend will see 100 percent of their $30 ticket go toward breast cancer research while witnessing Iron Chef-style throwdown and sipping all the complimentary cocktails and neat spirits they can drink. 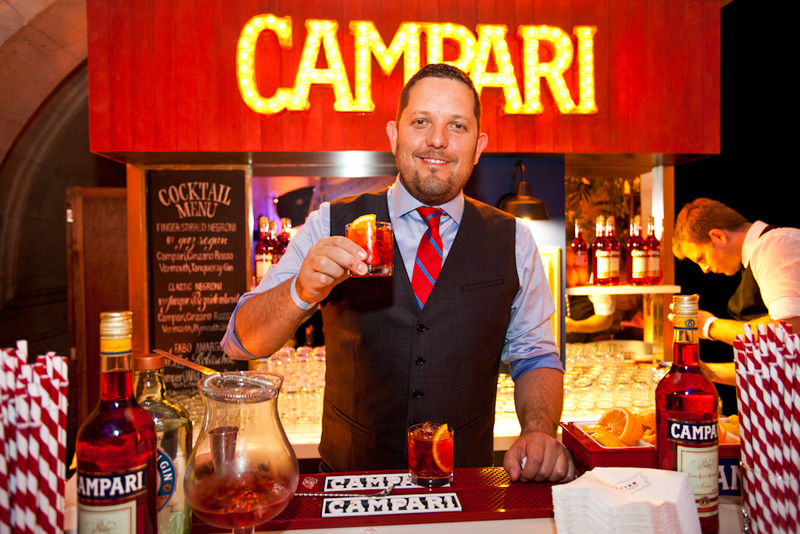 Not only does the champion earn bragging rights and the respect of her industry peers (judges include Dale DeGroff, Julie Reiner and Audrey Saunders), she’ll also get a trip for two to Paris, tour the Cointreau Bartender Academie, and receive a B.A.R. (Beverage Alcohol Resource) scholarship. Speed Rack, created by Lynnette Marrero and Ivy Mix, and produced in collaboration with CBLLC, has raised nearly $150,000 for breast cancer charities. For more information on Speed Rack, go here, and for tickets to the finals, click here. Thursday, May 16, 6 to 10 p.m., Element Nightclub, 225 East Houston Street. 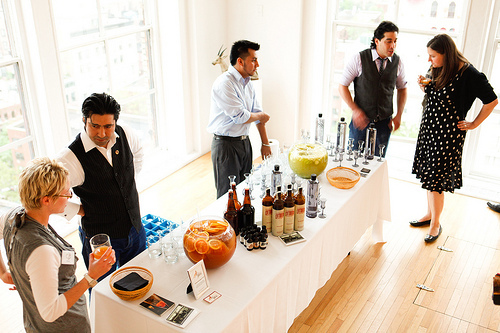 It’s almost that time again–revelers are gearing up for the 2013 edition of the Manhattan Cocktail Classic, May 17 to 21. While regular admission for the opening night gala is sold out, VIP tickets remain for the veritable prom of the cocktail industry, which at $295-$395 get you four hours of endless drinks (are 25,000 cocktails enough to choose from?). 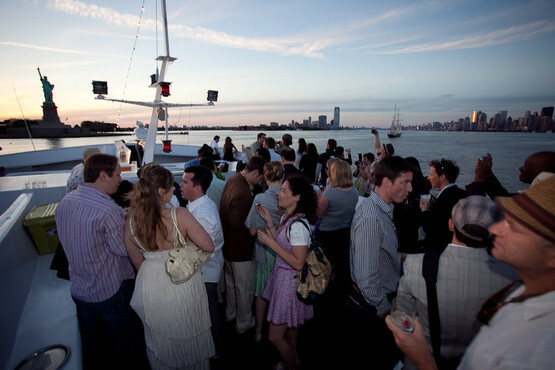 Many of the tastings and educational sessions are also sold out by now, but tickets still remain for events such as a decadent afternoon of chocolate and cocktail pairings; a Culinary Tour of Lower Manhattan with Oban, Talisker and Lagavulin; and the Indie Spirits Expo, a massive walk-around tasting of small-batch spirits. Prepare the hangover remedies now, folks. Bottoms up! 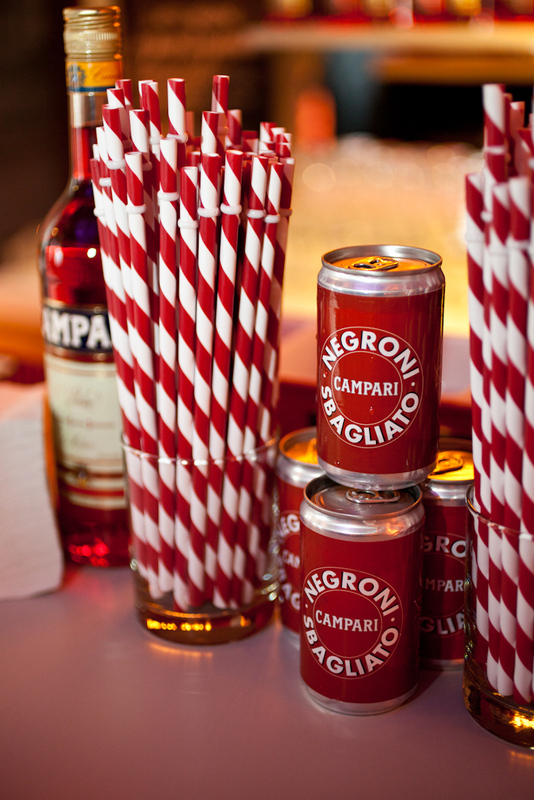 The Manhattan Cocktail Classic is around the corner. 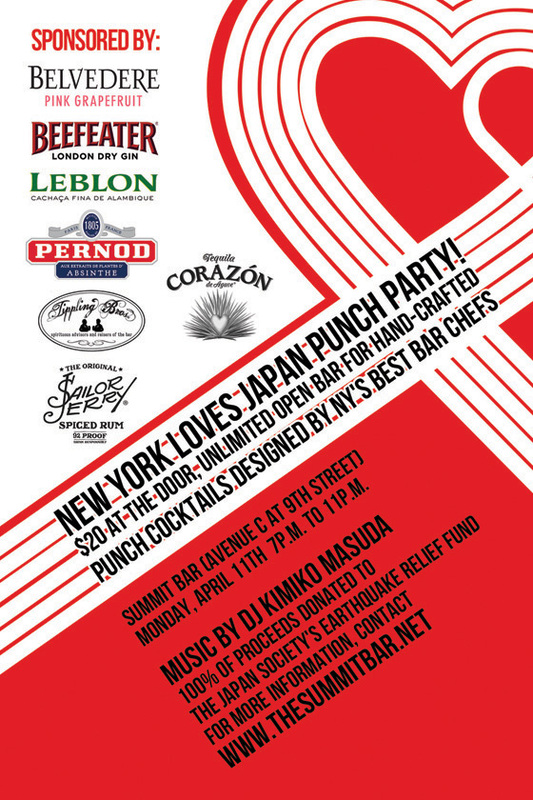 On Monday, April 11, the local cocktail community is coming together at the Summit Bar for a New York Loves Japan Punch Party to benefit The Japan Society’s tsunami relief efforts. A $20 donation at the door gets you unlimited refills of hand-crafted, Japanese-inspired punches featuring Belvedere vodka, Pernod Absinthe, Beefeater Gin, Classic & Vintage Spirits, Sailor Jerry Rum, Leblon Cachaça, and Corazon Tequila. The event goes from 7 to 11 p.m. and also features $10 pours of Japanese whiskey, benefit t-shirts for sale and tunes by DJ Kimiko Masuda. While VIP tickets to the French Spirits Soiree at Astor Center on April 14 have sold out, general entry tickets are still available, entitling you to unlimited drinking, French cheese and charcuterie from Murray’s Cheese, SCRATCHbread rustic bread, live jazz by The Hot Sardines, a saucy burlesque performance by Calamity Chang and more. Not to be missed! 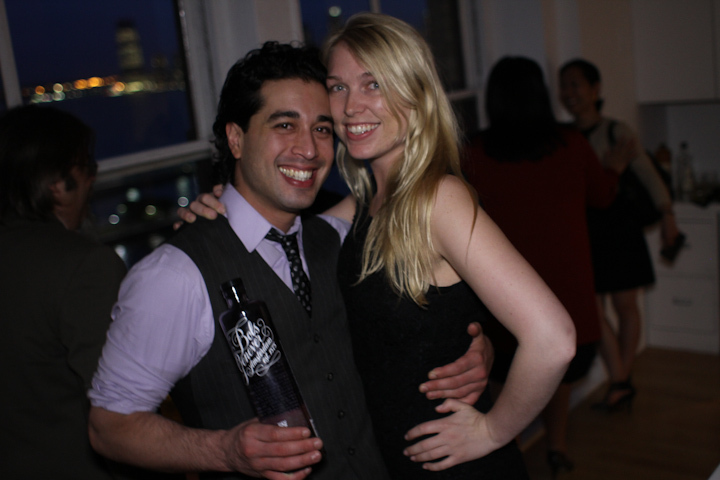 The April 29 deadline is fast approaching to be considered for 2011 G’Vine Gin Connoisseur, which sends 15 finalists to France for the showdown. The grand prize is one of the sweetest around: $3,000, a year’s supply of gin for your bar, a platinum vine-flower pin and an intercontinental bar tour of some of the world’s best gin bars. If you are interested in participating, you should attend the April 14 preliminary in NYC. 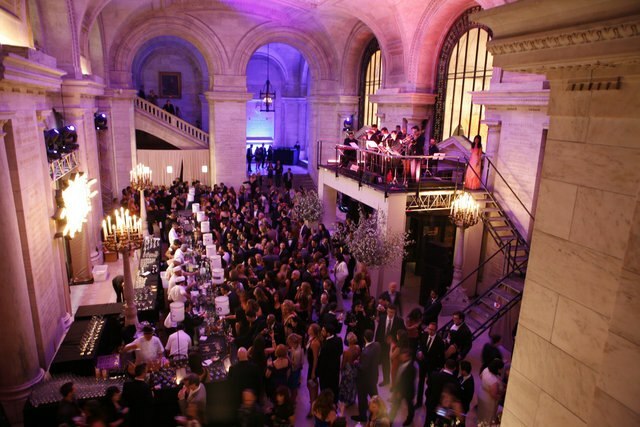 In case you haven’t heard by now, tickets to the Manhattan Cocktail Classic (May 13-17) are on sale, and many events, including the gala at the New York Public Library, are already sold out. Events still up for grabs include an ’80s-themed rum bash, a sunset cocktail cruise, the Indy Spirits Expo, and plenty of seminars and “behind-the-bar” sessions. You won't want to miss Calamity's electric performance at the French Spirits Soiree on April 14! Pierre Ferrand Selection des Anges will be among the Cognacs sampled Monday night at Brandy Library. Warm up with some of the finest Cognac around from 6 to 8:30 p.m. on Monday, January 31 at Liquor.com’s Exclusive Cognac Tasting at Brandy Library. Dizzy Fizz readers can enjoy a whopping $30 off the $45 ticket price with the code “DIZZZYFIZZ“–that’s just $15 [yes, that’s three Zs in Dizzy]! Sample 15-plus Cognacs including the Pierre Ferrand Selection des Anges, an average of 30 years old, along with gourmet cheeses and charcuterie. The Counting Room in Williamsburg recently announced its new cocktail menu, streamlining its selection to five drinks which will all be pre-batched. Citrus will be left out of the batch and mixed per order to ensure freshness. Customers can still order bartender’s choice from the full bar selection. To celebrate its new liquor license, Brooklyn Wine Exchange in Cobble Hill is declaring February “Mixology Month” and offering free classes on drink-making. The ABC’s of Mixing Drinks with Audrey Saunders kicks off the series at 7 p.m. on February 2. Check out the full schedule here. 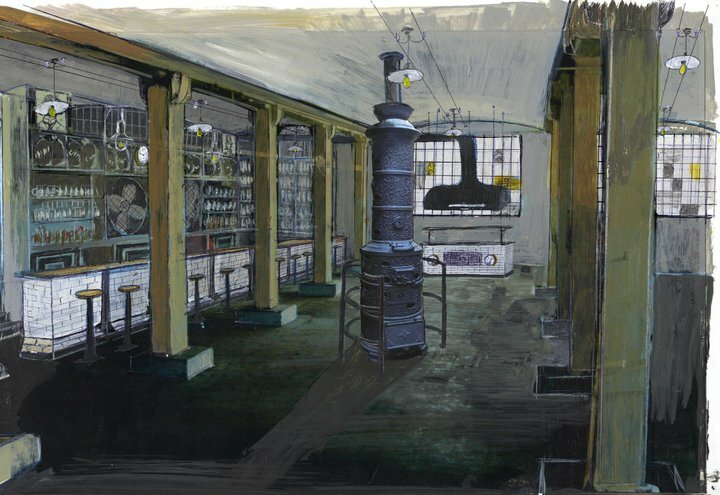 Rendering of The Pilsener Haus and Biergarten, coming to Hoboken, N.J., this spring. *A previous version of this article said that the Rémy Martin Louis XIII would be sampled at Monday’s event at Brandy Library. The brand has since been removed from the event. 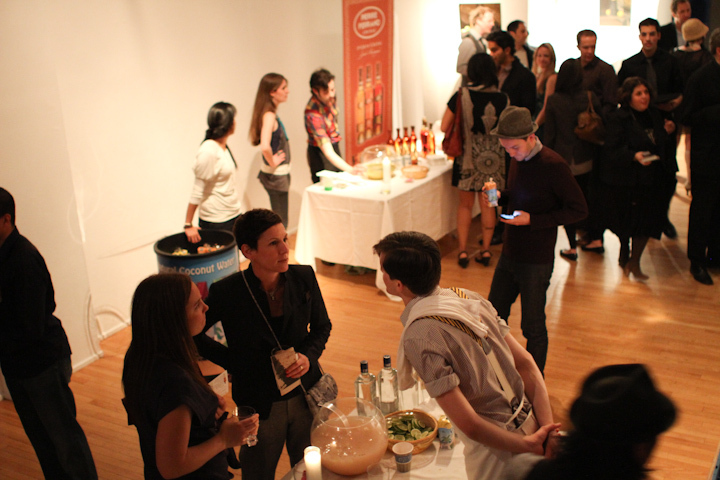 Dizzy Recap: Manhattan Cocktail Classic and Tastemaker’s Punch! 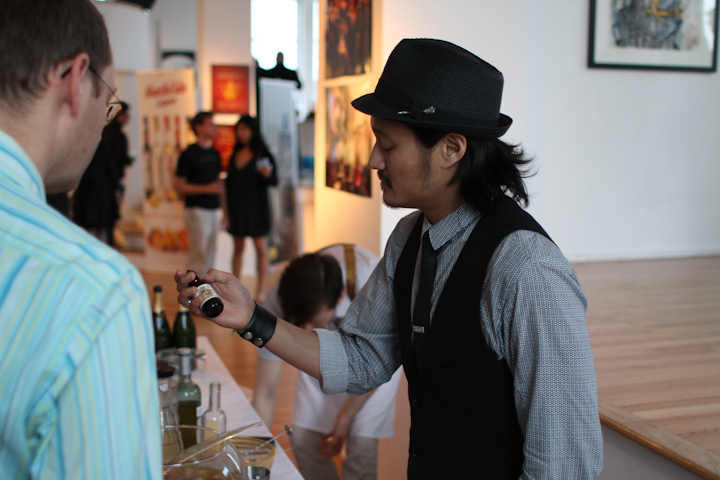 Art and punch made for a stimulating scene at Tastemaker's Punch. All photos by Lush Life Productions. Well hot damn–the Manhattan Cocktail Classic flew by like a bat out of Eyjafjallajökull. 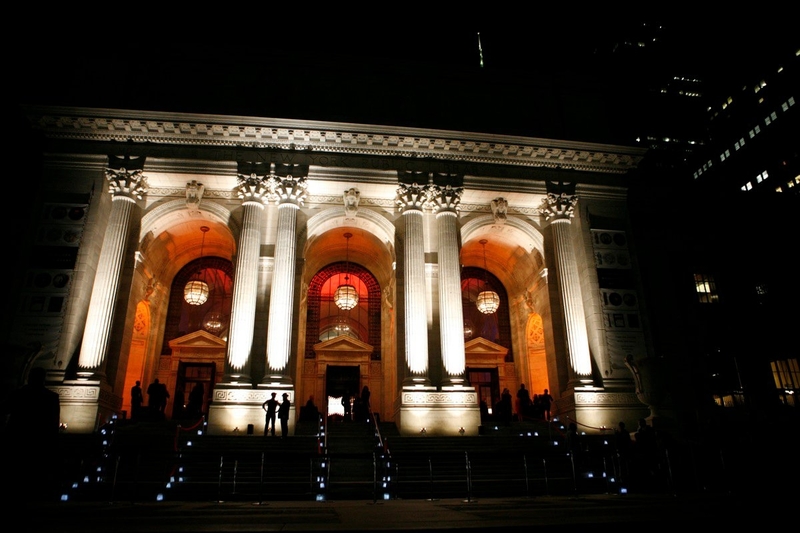 I had the wild idea to put on an art exhibit/punch party so I only attended the Gala at New York Public Library and the Three Hour Tour around Manhattan Island–smashing good times all around involving well-dressed cocktailians from all over and addictive libations. I’ll be looking to other bloggers to tell me what I missed at the seminars, Behind the Bars, and other events. Speaking of other bloggers, MCC just happened to kick off the night after World Cocktail Day, aka my first blogiversary, which coincidentally is the same for LA cocktail culture blogger Daniel Djang, aka Thirsty in LA. I’ve been reading Daniel’s watch on the budding LA cocktail scene and only recently realized that we shared the same blog bornday. I was stoked when I heard Daniel would be visiting for MCC. He met a bunch of us at Death & Co. right after landing in NYC to share a toast with me, and then we rolled to Painkiller where we had a few too many sips of Scorpion bowls, Mai Tais and Singapore Slings. I’m not sure this was necessary the night before MCC, but it was a blast. It also didn’t hurt that Tony Abou-Ganim, Eric Alperin, Mindy Kucan, and Johnny Iuzzini were among the crowd at Painkiller that night. 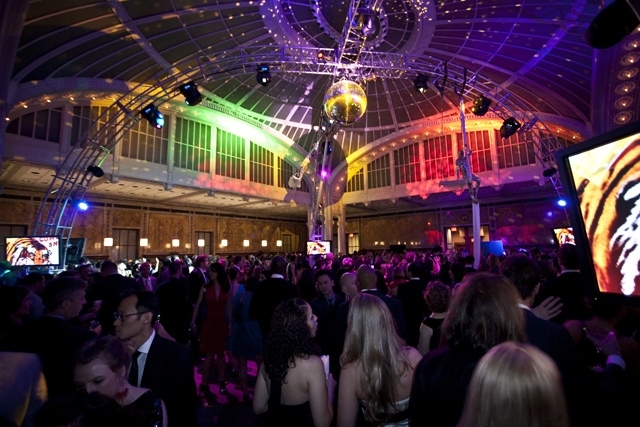 I don’t even know where to begin with the Gala–event of the year?! Lesley Townsend, Georgia Tan, and their production team all deserve a collective bow from the cocktail community for pulling off such a massive, glamorous affair. 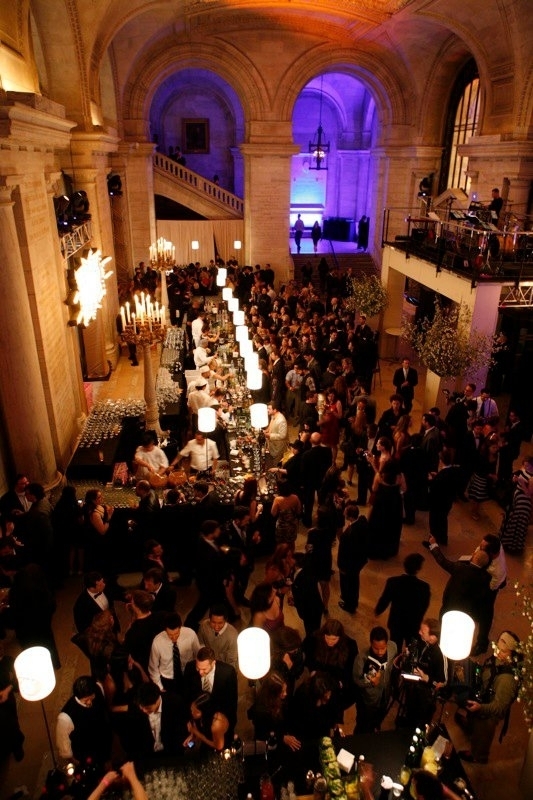 All four floors of the New York Public Library were transformed into an endless open bar full of random wonders–you know, Oompa Loompas and the like. Towards the end of the night, most everyone made their way to the air conditioned basment which Diageo turned into the “Stork Club,” named for the historic New York nightclub run by ex-bootlegger Sherman Billingsly from 1929 to 1965. My dressed-up dates, Emily Cavalier and Pej Azarm, and yours truly. 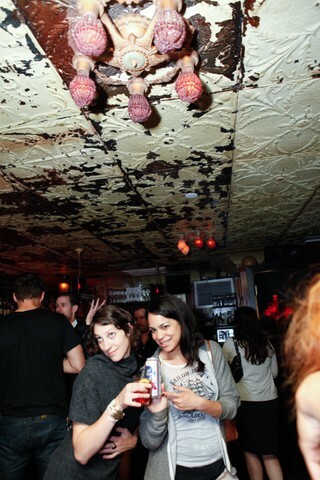 Photo via Metromix NYC. In between spouts of event planning, I managed to make it onto the Royal Princess for the Tippling Point’s inaugural event, the “Around the World in Five Cocktails” sunset cruise. The weather couldn’t have been more perfect as we sipped cocktails from Moet Hennessy’s line of fine spirits–Hennessy, Belvedere Vodka, Ardbeg, 10 Cane Rum, and Grand Marnier, all mixed by world-class mixologists: Jacqueline Patterson of Heaven’s Dog (San Francisco), Thomas Waugh of Death & Co., John Lermayer of The Florida Room (Miami), Richard Boccato of Dutch Kills and Painkiller, Sean Kenyon of Steuben’s (Denver), H. Joseph Ehrmann of Elixir (San Francisco), and Danny Valdez of Cure (New Orleans). At sunset, the cruise ship paused in front of the Statue of Liberty next to a vintage sailboat for a patriotic and picturesque moment, reminding me of our freedom to imbibe. 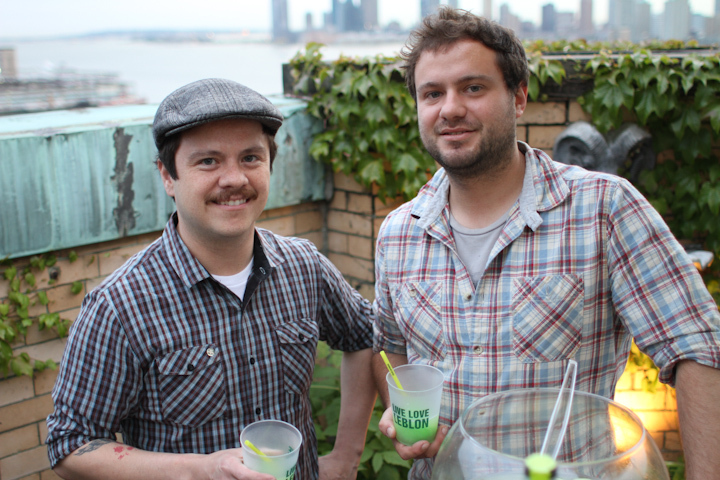 And on the fourth night of MCC, my big night finally came to fruition — Tastemaker’s Punch! I can’t express how thrilled I was to see artwork from Jill DeGroff, Claw Money, Nicole Desmond, Charles Hardwick, Elba Giron, Jackie Neale Chadwick, Vanessa Bahmani, and Leo Borovskiy on the walls of Ramscale Gallery. And of course there were the punches (recipes below) by Enzo Lim, Maxwell Britten, Abigail Gullo, Orson Salicetti, Frank Cisneros, Erick Castro (of San Francisco), Payman Bahmani, Aaron Doherty, The Cocktail Guru’s Hal Wolin, and The Tippling Point’s Jason Littrell. DJs from the monthly Discovery party at Santos Party House, VDRK and Free Magic, kept the good times flowing, and sushi and ceviche from Richard Sandoval’s ZENGO was devoured just as fast as we could pass it out. Dave Wondrich led us through a long list of historical figures whom we have to thank for the wonderful gift of punch, starting with British sailors who discovered the five-ingredient concoction in India in the 16th century. Dave announced that his book on all things punch, “Punch, or the Delights and Dangers of the Flowing Bowl,” will be out this November. And yes, it also just happened to be my birthday that night (along with Eryn Reece and Meredith Modzelewski! ), so thanks Jason for taking over the mic to have everyone sing happy birthday while I blushed in the corner. 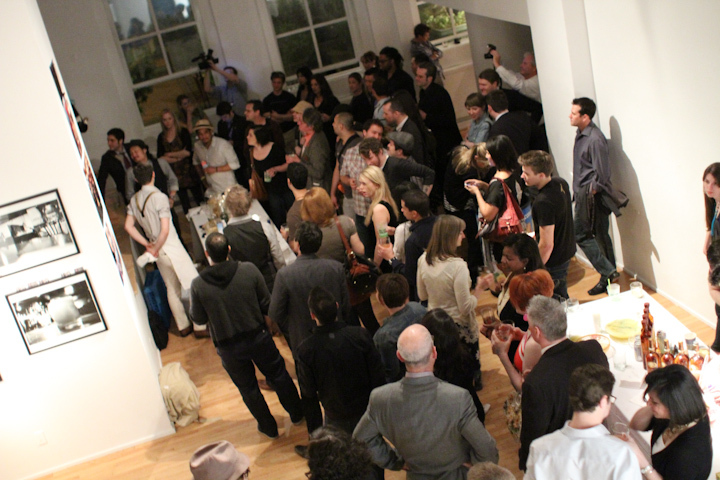 How many people get to say that they had Dave Wondrich, Jill DeGroff and Claw Money at their birthday party? Even Gary “Gaz” Regan made a latenight appearance, helping himself to some punch. 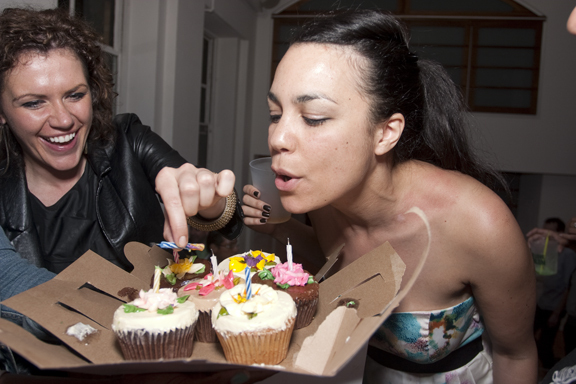 Birthday blowout, yo! Photo via Umamimart.com. So many to thank: Bols Genever, Pierre Ferrand Cognac, Mathilde Fruit Liqueurs, Leblon Cachaca, Laird’s Bonded Applejack, Plymouth Gin, Tuthilltown Spirits, Catdaddy Moonshine, Milagro Tequila, Sailor Jerry Rum, A.B. Smeby Bittering Co., Vita Coco Coconut Water, Mana Fine Arts, and the MCC team: Lesley, Georgia, and Don Lee. I also want to personally thank Kerry Hoffman, Lincoln Chinnery, Russell Davis, Gail Schoenberg, Nosa Garrick, Erin Garcia, Amy Kelly, Olga Boyko, Mark Garcia, Iman Kedir, Ashley Klanac and Nora Worthington. 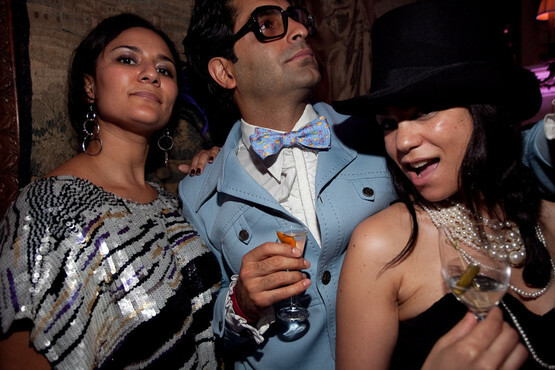 Enzo Lim, one of Time Out New York's "Best-Dressed New Yorkers." Photo by Lush Life Productions. 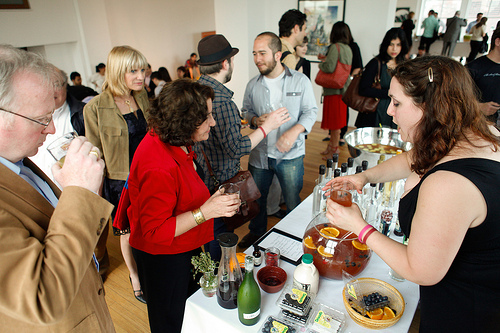 Maxwell Britten explains his gin punch to captivated guest Linda Lawler. Photo by Lush Life Productions. 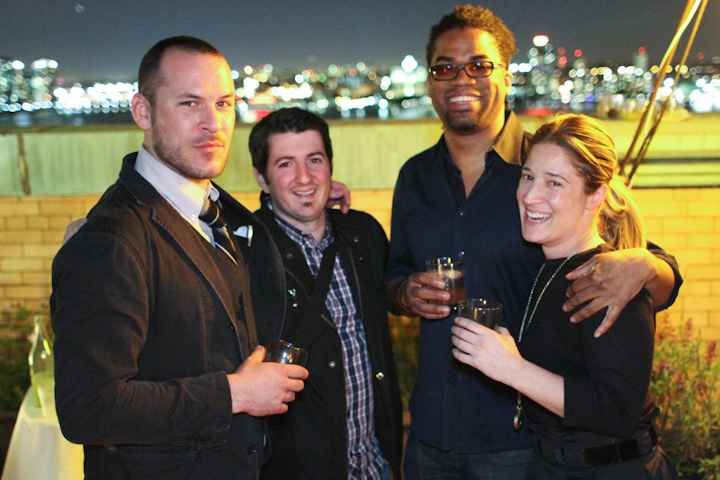 Jason Littrell, Chris Patino, Charles Hardwick, and Jaime Keller on the patio. Photo by Lush Life Productions. Payman Bahmani, second from left, and Orson Salicetti, second from right, explain their punches. Photo by Philip Anema. Erick Castro and friend on the patio before dusk. Photo by Lush Life Productions. Orson Salicetti and Katie Darling. Photo by Lush Life Productions. 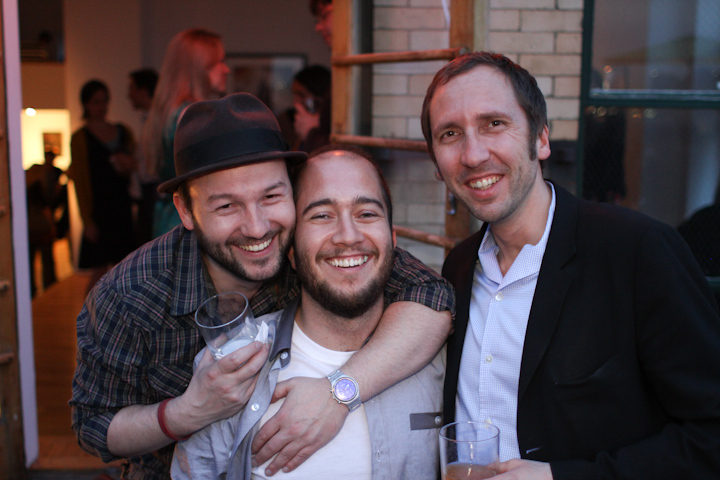 Tuthilltown Spirits' Gable Erenzo (center) and The Bitter Truth's Alexander Hauck (L) and Stephan Berg (R). Photo by Lush Life Productions. 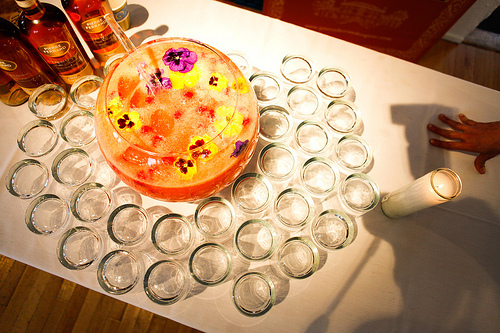 Frank Cisneros' Raspberry Beret Punch, ready to serve! Photo by Philip Anema. Abigail Gullo ladles her Half-Moon Mountain Jam. Photo by Philip Anema. 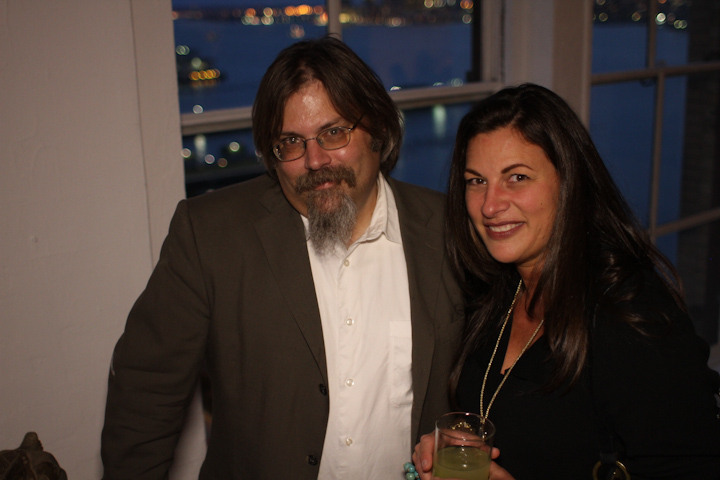 Dave Wondrich and Manuela Savona. Photo by Lush Life Productions. Eryn Reece (birthday twin! ), Elba Giron, and Lisa Victoria Hare. Photo by Lush Life Productions. 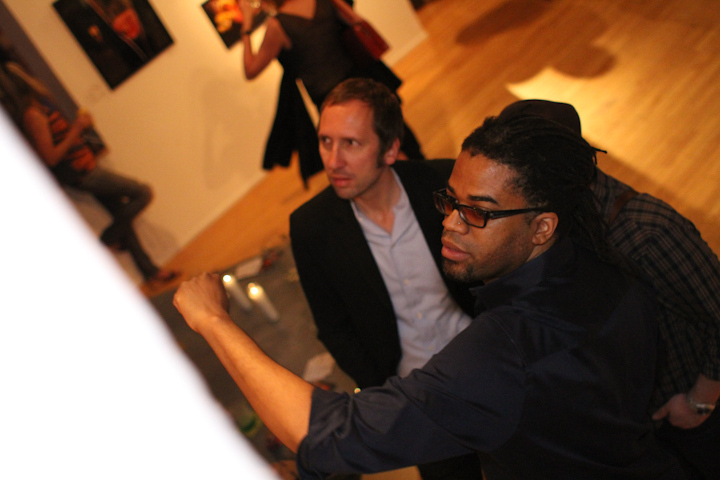 Charles Hardwick shows Stephan Berg his paintings. Photo by Lush Life Productions. 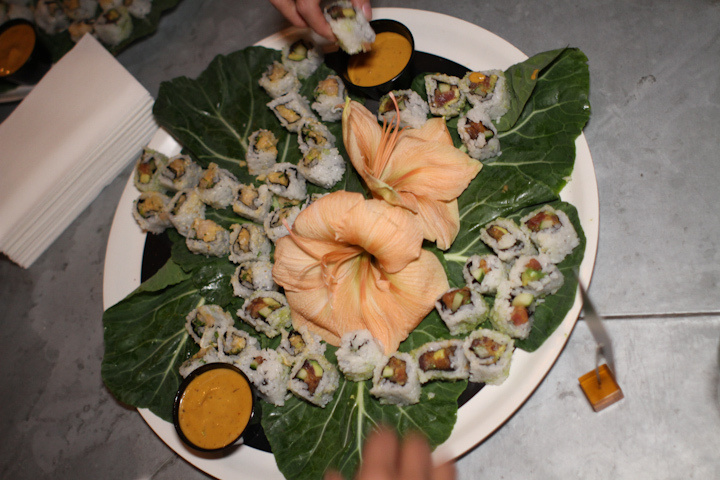 Tuna and Yellowtail sushi rolls from Zengo. MmmMmm! Photo by Lush Life Productions. 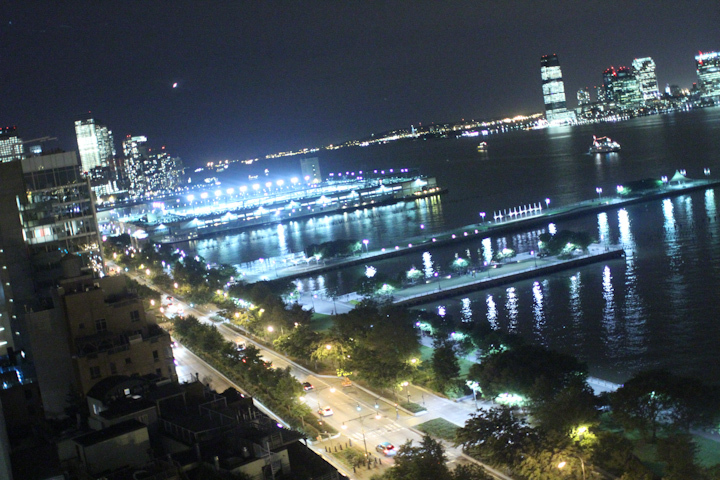 View of the Hudson River from the rooftop patio at Ramscale Gallery. Photo by Lush Life Productions. 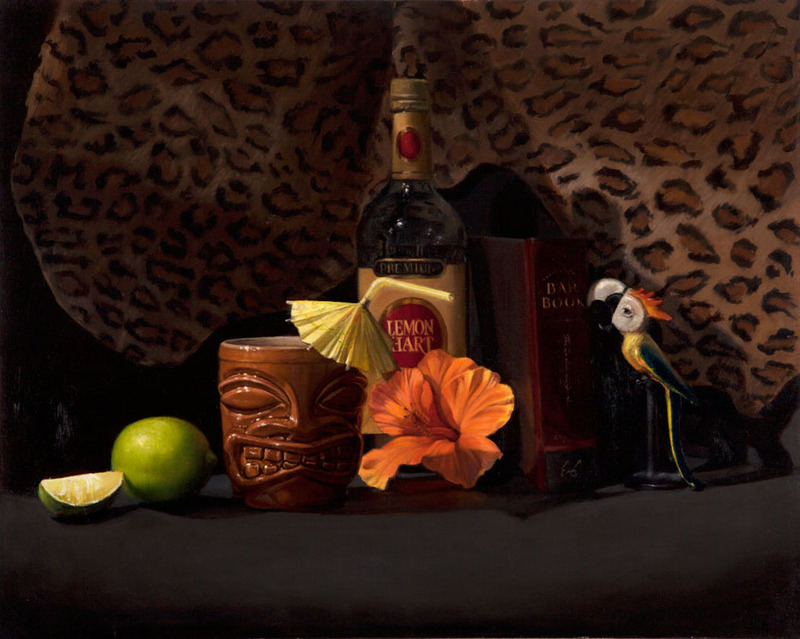 Nicole Desmond's Mai Tai still life. 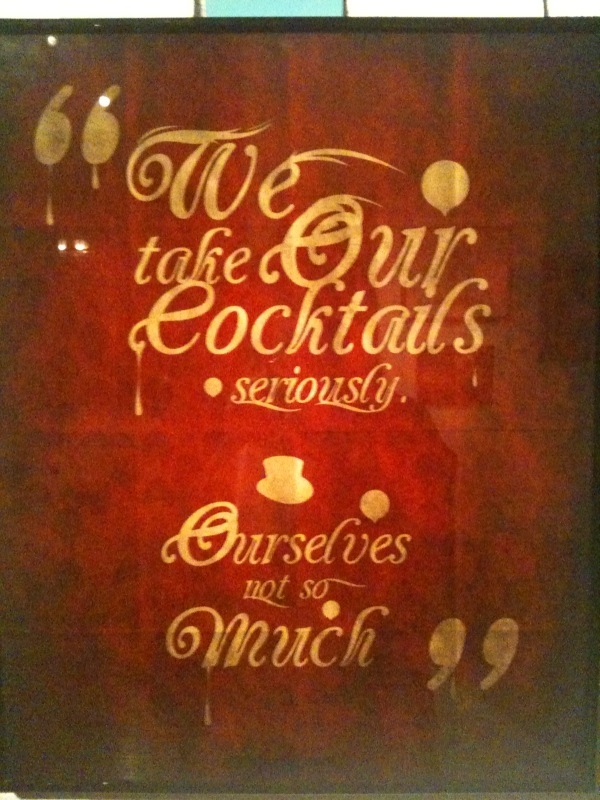 Elba Giron's poster for We Shoot Cocktails. Photo via Emily Cavalier. 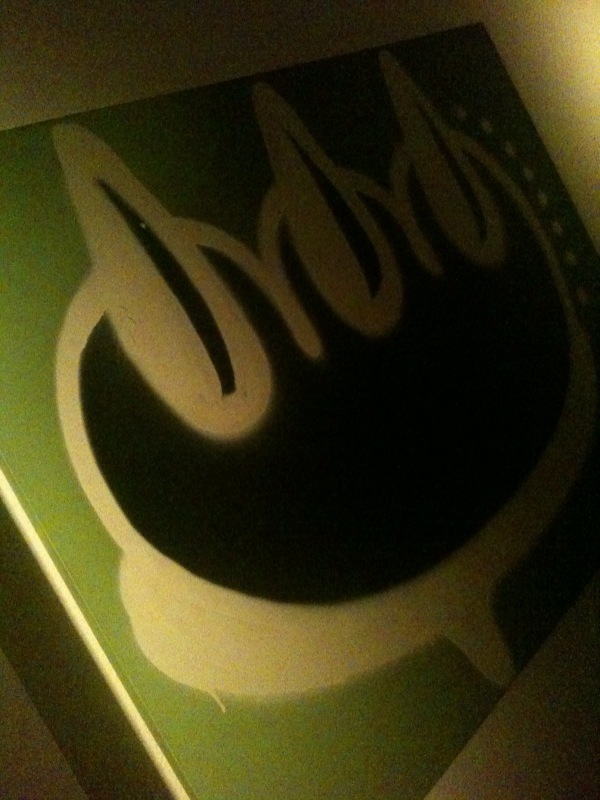 Painting by iconic grafitti artist Claw Money. Photo via Emily Cavalier. 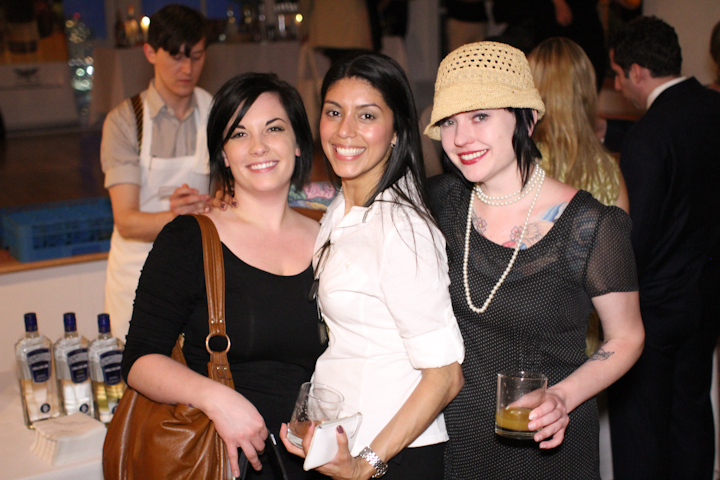 Everyone should feel proud for helping make the first Manhattan Cocktail Classic a huge success! Can’t wait to do it again next year, only bigger and better! Lesley Townsend and yours truly at the Macao afterparty. It's a wrap! Photo via Handcrafted PR.